3D printing is a form of additive manufacturing. 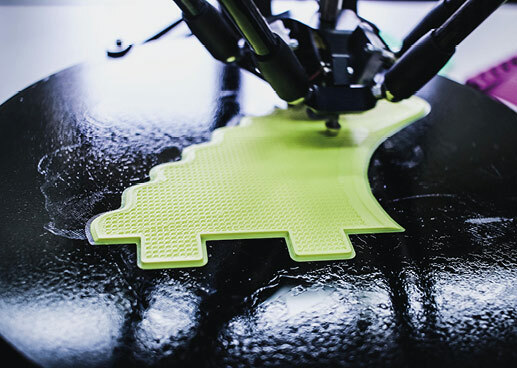 There are several common types of 3D printing, but at their basis they all follow the same principle: Adding layer by layer of material to create an object. Different technologies are used for different design stage prototypes. The most commonly used method is FFF/FDM printing at Bang Creations, due to the ability to rapidly prototype and quickly validate, rather than other methods which can be more laborious. FFF printing, more commonly known under the trademarked name fused deposition modelling (FDM), is the most common form of 3D printing. It works by using a hot-nozzle, in which plastic filamnet is pushed through and melted, drawing lines of plastic which then solidify. We often use FDM printing during the detail design prototyping. SLA printing uses UV lasers to harden layers of resin. The part is lifted out of the resin, re-submerged, and another layer printed, hundreds of times. This technology produces more accurate parts than FDM printing, so is often used for creating accurate prototypes for injection mouldings. We will often use this type of printing in works like, looks like prototypes. SLS printing uses a bed of powdered plastic material, usually a type of nylon (PA). A laser sinters (fuses together) the top layer of powder into the desired shape. The top layer of the powder is then replaced and the process repeated. Often parts made using this process are vibro-polished in a tub of silicon beads, which gives the surface of the material a near injection-moulding quality. Parts made using the process are porous due to the powdered nature of the material. The most commonly used 3D printing methods used at Bang Creations are SLA and FDM. For detail design we use our own Ultimaker printer to produce FDM parts, this is quick, cheap, and relatively accurate for this stage since components aren't generally fully engineered. It allows us to rapidly ratify components and ideas, progressing through the product development process at speed. It is also not uncommon for us to use SLA printing, this is usually in the engineering design stage when we need to test out components, seals, and tolerances for injection moulding. However often we have to use CNC machines to prototype components out of physically accurate production material, since 3D printing won't produce physically accurate parts due to the weaknesses around layers and the brittleness of the material.